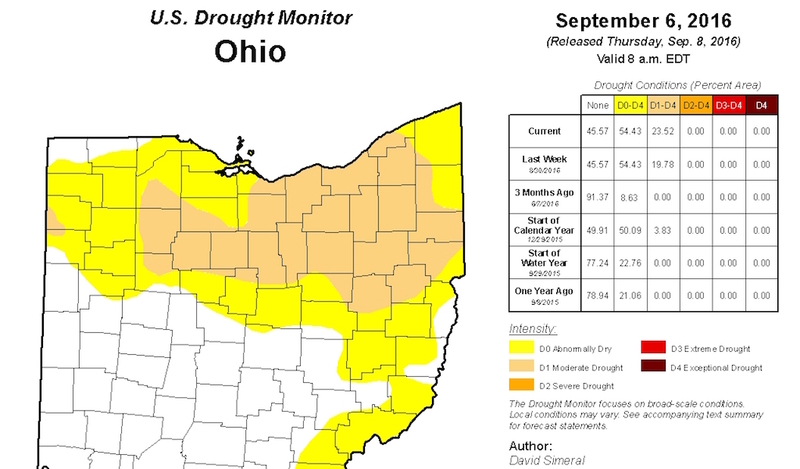 Map of drought conditions in Ohio, as of Sept. 8 release. SALEM, Ohio — Most crops got off to a decent start this year in Ohio and Pennsylvania. But the success of the crop from mid-season onward all depended on who got the rain — and who did not. For most of Ohio and Pennsylvania, and especially upstate New York, rain was a spotty thing that came in time for some counties, while going around others, leaving behind an unusual and unfortunate path of drought across the three states. On the upside, heavy rains came by mid- to late August. But for many crops, especially corn, the damage had already been done. 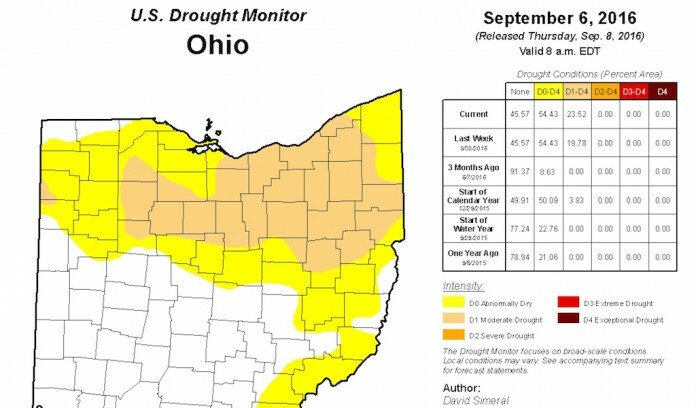 According to the U.S. Drought Monitor, the official government source of measuring of drought, at least 20 Ohio counties and 10 Pennsylvania counties were still affected by moderate drought as of Sept. 8, and 54 percent of Ohio was considered abnormally dry, with 62 percent of Pennsylvania still abnormally dry. The situation is even worse for Pennsylvania, where 6 percent of that state is in “severe drought,” the third level of severity on a five-level scale. And in New York — the hardest hit in our area — some counties are still suffering “extreme drought,” the fourth of five severity levels. Harvest is still in the beginning stages for most crops in the Farm and Dairy readership, but farmers are already seeing the affects in their yields. Corn is still king across the nation, with more than a 10 million acre-advantage over soybeans. In Ohio, the quality of the corn crop was closely tied to counties that received rain at germination, and again at pollination. Early-planted Ohio planted corn seemed to fare better, with more moisture available for germination, while corn planted in mid-May or later was more likely to suffer at germination. 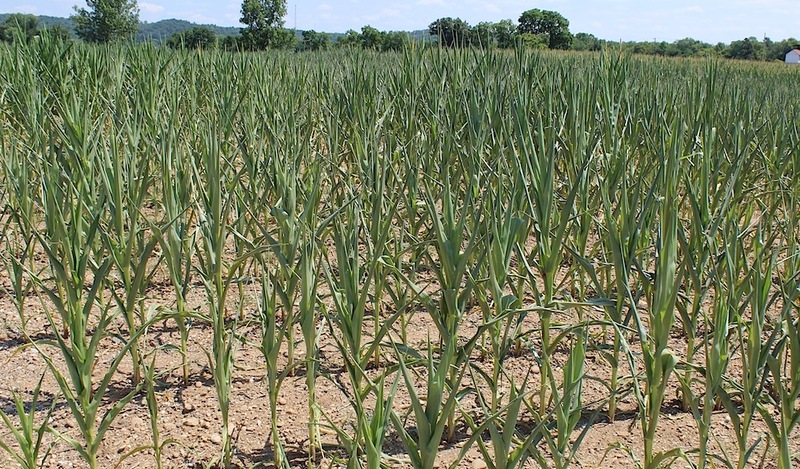 In western Pennsylvania, however, some later-planted corn did better than early plantings, because August rains came while the corn was still pollinating. 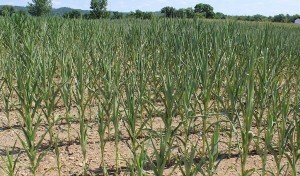 The drought hurt Ohio and some Pennsylvania farmers again by mid-summer, when corn was beginning to tassel and pollinate. Dry conditions combined with intense, 90-plus degree heat, and led to poor-quality pollination for some farmers, which led to reduced ear size and issues with cobs not filling. Peter Thomison, Ohio State University corn specialist, said that in areas of prolonged drought, ears are absent or “barren,” or severely reduced in size, with scattered kernels, known as “nubbins.” Some ears produced kernels, but aborted the kernels nearest the tip, resulting in “tip-back,” and some ears produced “zippers,” or ears that have missing rows of kernels. All of these factors point toward a reduced corn yield in drought-stricken counties. However, growers in counties that received ample rain are reporting good yields, similar or even better than last year. On Aug. 1, the Ohio office of the National Agricultural Statistics Service reported that Ohio’s average corn yield is forecast at 163 bushels per acre, 10 bushels above last year. In Pennsylvania, corn is forecast at 141 bushels per acre, a 6-bushel decrease from last year. Early crop condition again depended on moisture. In Ohio, some beans struggled to emerge, because of a lack of rainfall after planting. The best beans were in counties and parts of counties that received ideal moisture for germination. Late summer rains helped the bean crop, however, and counties that received those heavy rains have some good-looking bean fields. 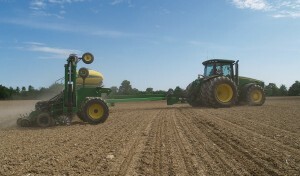 Double-crop beans, or those planted following wheat are either non-existent for many Ohio farmers, or struggling, depending again on how much moisture fell after wheat harvest. Fields in some Ohio counties are facing yellowing, and early dry-down, while others are on track for a healthy crop. According to NASS, soybean yield is forecast at 52 bushels per acre, up 2 bushels from last year. Total production is forecast at 249 million bushels, up 5 percent from last year. In Pennsylvania, soybeans are predicted at 46 bushels per acre, a 2-bushel increase over last year. However, about 40 percent of the Pennsylvania soybean crop is considered fair to very poor, with only 60 percent considered good to excellent. The poor condition of corn in drought-stricken counties has caused producers to consider chopping it for silage, instead of grain. But researchers advise there are steps that need to be taken, to prevent spoilage and possible nitrate toxicity. In drought conditions, nitrates can accumulate in the stalk of corn, with the lower portions having the highest concentration. Producers may need to test for nitrates, to determine the toxicity level. If levels are too high, they may be able to chop at a higher height (10-12 inches), to avoid the most toxic part of the plant. 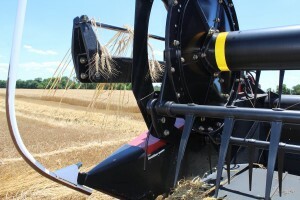 Chopping higher will reduce yields, and should only be done if tests determine it’s necessary. Also, research shows that nitrate levels quickly reduce during the ensiling process — so if the silage is stored for long enough, levels could drop on their own. But experts warn that the compounds that leave silage during this process, known as nitrous oxide, are highly toxic to both humans and animals, and must be avoided. Even with silage, yield losses are likely this year, with as much as an 18-46 percent loss, based on similar drought years. Ohio will harvest 390,000 acres of alfalfa this year, according to the National Agricultural Statistics Service. Yield is predicted at just 2.90 tons per acre, the same as last year, when yields were reduced because of consistent rainfall. In 2014, Ohio hay yielded much higher, at 3.5 tons per acre. 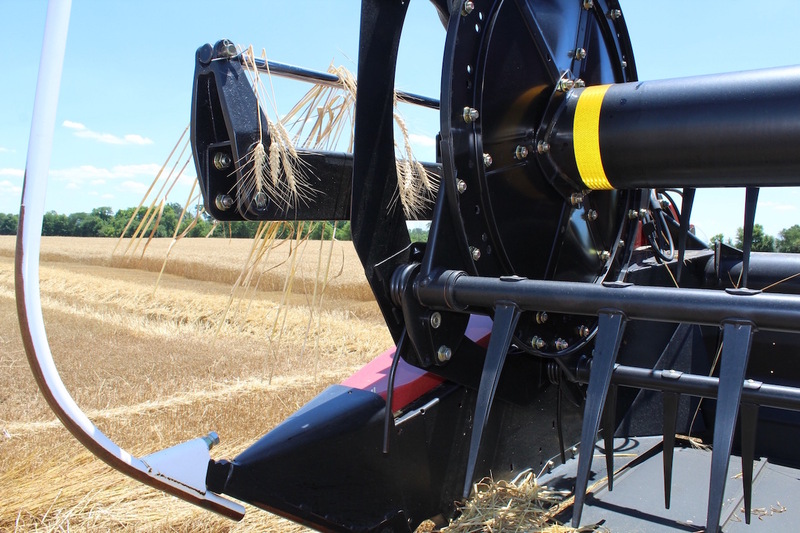 In Pennsylvania, producers plan to harvest 360,000 acres of alfalfa and alfalfa mixes, at a slightly better yield than last year, of 2.80 tons per acre, but down from the 2014 yield of 2.90 tons per acre. 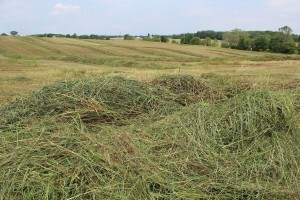 John Grimes, a forage and hay specialist with OSU, said Ohio’s alfalfa crop has been about as variable as he can remember, generally drier conditions in the northern half, with some excess moisture further south. He said some farmers in southern Ohio had to delay cuttings, because of too much rain. Meanwhile, some farmers in northern and northcentral Ohio delayed cuttings because of lack of rain, opting to go ahead and harvest, with the hope that rain would come and rejuvenate the next cutting. The 2016 wheat harvest was one of the few crops that did exceptionally well this year. In Ohio, the average winter wheat yield was about 77 bushels per acre, up 1 bushel from last year, and the national average was 54.9 bushels per acre, up more than 12 bushels over last year. Quality was generally good, with some reports of lower test weight, but very little disease issues. Bill Dodd, president of the Ohio Fruit Growers Marketing Association, said apple and peach growers seemed to fare pretty well this year. Tree crops generally have deeper roots than field crops, and are naturally more drought-resistant. But equally important — the rains fell at the right time. Those heavy August and early September rains came at a time that helped the trees to continue their natural cycle of late-season fruit production. “At this point, we’ve had enough rain here recently that I think the crop is going to finish off pretty well,” Dodd told Farm and Dairy. Dodd operates his own orchard, Hillcrest Orchards, in Amherst. He said the heat and dry weather actually benefited some peach growers, because it helped make the peaches more sweet. Newly planted trees would have been more suspect to drought damage, but Dodd said most orchards irrigate younger trees to help get them established. Still, Ohio’s overall apple production will likely be down, according to NASS. The Aug. 1 crop forecast put this year’s apple crop at 42 million pounds, down from 50.5 million last year. The grape forecast is 5,000 tons, an increase over 3,500 tons in 2015. The peach forecast is 2,500 tons, up from 1,200 tons last year.